Register your product and get all benefits. Have you ever heard how 09 by 3 sounds? The XBase09 was a legend already but a little limited though. 3 instruments haven't been too small at all, but some situations may have stayed unexplored. For this reason we brought out an appropriate follower. 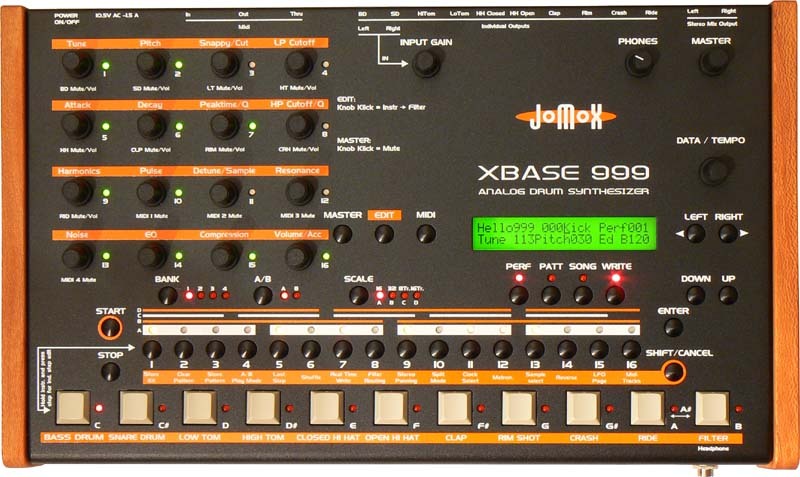 XBASE999 steps into a new analog age. Bass Drum, Snare Drum, Lo Tom, Hi Tom, Hi Hat, Clap, Rim, Crash and Ride. All instruments are polyphonically playable and have individual outs. From HH section onwards it's short 8-bit samples played back with an analog envelope as on the AirBase99. The sample flash ROM is bigger than ever: per instrument there are 31(!) samples. on BD, SD, LT and HT with digital control, means storeability and midi-controlability of all parameters. To make the disturbance of analog circuitry as small as possible, all D/A converters are specially adapted to the circuits and being integrated - with proven XBase/AirBase technology. Sound editing is done by endless rotary encoders for every analog parameter which lets you edit the sounds without any jumps or awkward turning jobs. Close to each knob there is a 3-color LED indicating which parameters for the selected instrument are editable. The most famous sound of the XBase09 is actually the kick drum. We have even put a parameter on top and provided the most wicked bass drum in the world with a compression value that lets you decide between a 909-style ultra compressed envelope or an 808-ish exponential curve (hint: MBase01). For the beat freak there is also some extremely good sounding and widely editable analog tom toms included - as with the AirBase99. As usual, the XBASE 999 has the genious step sequencer build in already. There are some improvements now: all patterns are A/B patterns, and it's your choice if it's 2 alternating 16 step patterns ore one 32 step pattern. The sequencer is made up by 3-color LEDs to indicate the individual step edit modes known from the XBase09 even better and more intuitive. The micro shuffle can now be edited for each instrument individually. Bank select has now an own switch. 4 banks with each 16 A/B patterns are made available, which results in 128 actual 16 step patterns. 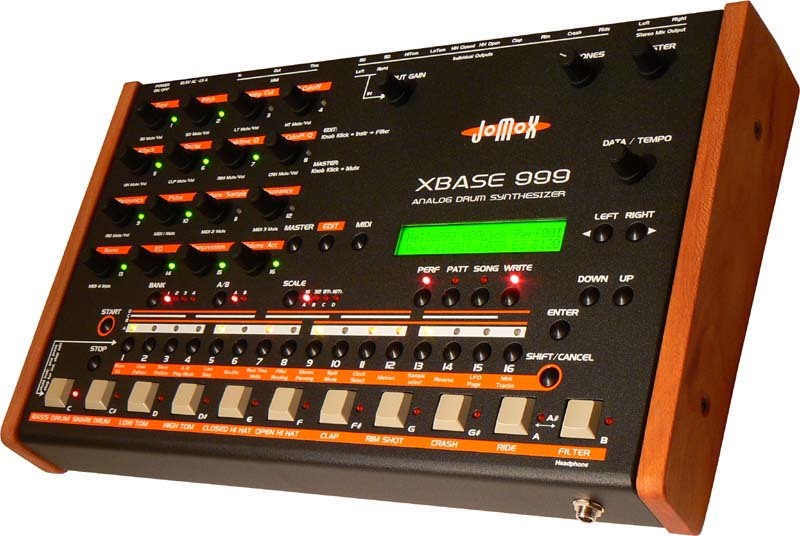 As an additional feature, the XBASE 999 has also an inbuild 16 step analog sequencer for the included external filter. Each of the 16 rotary knobs has a click function to activate an analog step which controls the X-filter cutoff. The filter is a stereo 2-pole multimode filter with an interdependent resonance and Q-control which sounds great for external audio signals and that can be used as a signal source in resonant modes, too. If resonance is low, Q control can make it narrow but never starts to oscillate. Only when resonance is then applied, the filter starts to whistle, and the bandwith can still be controlled (within certain borders) through Q. Each of the 2 filters can be individually arranged as lowpass, highpass, bandpass and notch. Plus, the 2 filters can be programmed as stereo, in parallel or in series or with cross feedback. Each instrument and the external input can be individually routed into the filter or being spared out. The stereo filter signal is mixed into the stereo bus with a VCA or can be purely led out via the ring of the stereo output jack. The LFOs can also control the filter to make it a real internal FX section. A stereo signal can be inserted and sliced by a VCA with an own envelope over the step sequencer. Or an external effects being inserted into main mix. Or just being filtered by the X-filter over the analog sequencer. all instruments except for kick drum can be panned in the stereo bus. If a plug is inserted to an individual input, the signal is spared out of the stereo bus. There are 4 additional Midi tracks to control external devices. The encoder knobs program the 12 halftones and octaves. Of course the XBASE 999 has again two phat LFOs that can be beat syncronized or run freely and can be routed to any destination. The Hi Hat section contains a great sounding analog band pass filter with independend lowpass, highpass and resonance controls. Other than the 8-bit HH samples, analog noise can be the sound source as well. For a more convenient and clear operation the XBASE 999 has now a big alphanumerical LCD display. Kits can be named and the analog step sequencer has a bar display. The sound flash memory in the percussion section (HH, Clap, Rim, Crash, Ride) which contains 31 samples per instrument can be overwritten by the user via midi sample dump in order to create own samples. We provide a small tool that converts your *.wav samples into the right formatted XBASE999 structure and lets you dump your own created short samples into the XBASE999. 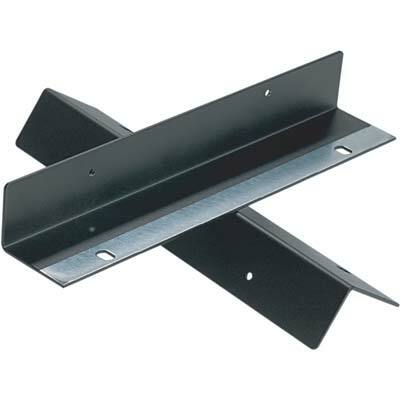 are available as accessories, and you can find them in the Jomox webshop.